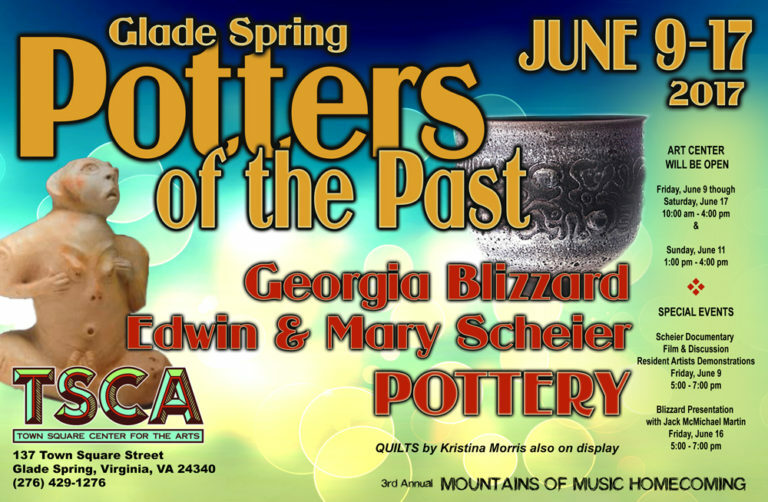 Town Square Center for the Arts (TSCA) is presenting “Potters of the Past” in conjunction with the Second Annual Mountains of Music Homecoming: Along the Crooked Road, June 9 through June 17. During this exciting event, pottery of three Glade Spring potters, Georgia Blizzard and Edwin & Mary Scheier, who now have pieces in the Smithsonian and other national galleries and collections around the world, will be on display. Neighbors and relatives will be sharing memories of these extraordinary potters, as well as a viewing of a documentary film. Resident TSCA artists will be demonstrating techniques for making pottery and ceramics. The gallery will be open from 10:00 am – 4:00 pm, Friday, June 9 through Saturday, June 17. On Sunday, June 11, special hours will be 1:00 – 4:00 pm. Glade Spring history will come alive during this event. You will not want to miss it!